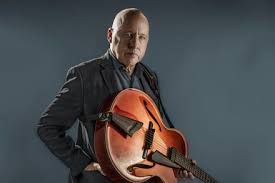 Mark Knopfler is not only one of the great guitar players in popular music but also one of, if not the very best, musical historians producing records that play as travels through the melting pot of influences that Knopfler has immersed himself in. With an almost magpie like eye for the very shiniest moments in the music he has enjoyed, twinned with his great technical ability, Knopfler’s laid back style offers up timeless vignettes of musical excellence that never fail to entice and please the listener. A feat he has repeated with ‘Down The Road Wherever’, his ninth solo studio album. Born at the tail end of the 1940’s in Glasgow before moving to the Newcastle area as a young boy, Knopfler’s music has always been reminiscent of the influences he must have experienced growing up in those vibrant port cities. 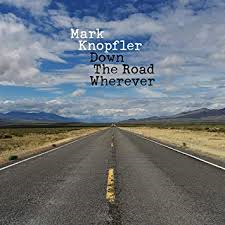 Whether that be the blues and country music that made it’s way via the merchant ships from the USA or the delights of cowboy movies in the flea pit cinema’s that was the main entertainment for youngsters in those days, it is apparent that those influences have remained close to Knopfler’s soul; a theory that is only enhanced by this latest solo release. That’s not to say that Knopfler’s doesn’t have anything new to say or a personal touch to be added. Far from it as this great technical guitarist shows abilities in style that can be as funky as Nile Rodgers or have the reggae sensibilities of a Peter Tosh or Bob Marley. But still, the overwhelming feeling is that he plays homage to those great blues and country players like Chet Atkins and B.B.King who he has worked with in the past. For me, though, Knopfler’s great skill is his ability to leave space and in doing so creating a cinematographic work. Harking back to those great cowboy movies of the 1950’s, Knopfler, has made a soundscape into which you could imagine Alan Ladd, as Shane, riding off into the distant desert, perhaps whistling a tune as penned by this great student of the history and music of outlaw America. And whilst on occasion the lyrics Knopfler writes, and for sure there has been a certain amount of comment about songs referencing bacon rolls in this house, maybe slightly obtuse or bewildering, there is no doubting that he is a songwriter of great musicality that is backed up by his amazing technical playing ability.